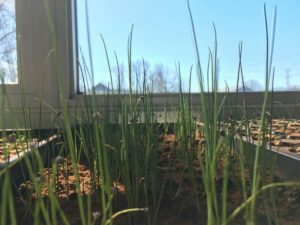 Last Wednesday March 20th was the Vernal Equinox, and I think it’s safe to say that most of us are happy to see spring arrive! The days are getting longer, and we don’t need to bundle up so much before heading outside. Spring is an exciting time of year for those of us involved in the market. 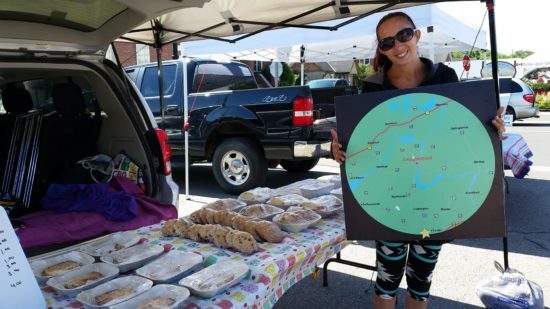 As you may know, the Campbellford Farmers’ Market is run entirely by vendor volunteers. At the beginning of March, we hold our Annual General Meeting where we elect the Market Executive, which is the governing body of our market. For the 2019 season we welcome back Jenny Madden as Chair, Andrew Vokes as Treasurer, Amanda Vaughan as Secretary, and Hope Herfst as a Director at Large. New for this year, we’re happy to be joined by Melissa Smeets as Marketing Director. This team is excited to bring the best farm, food, and artisan vendors in the area to the market! Our farms, gardens, and kitchens are gearing up for our opening market days – Wednesday May 1st and Saturday May 4rd. We’ll be joined this year by several exciting new vendors, who we’ll tell you about as the beginning of the season nears. 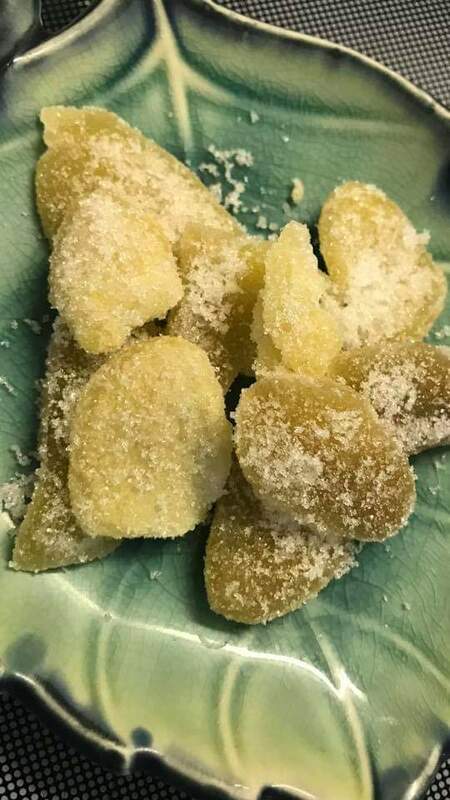 In the meantime, we’ve got updates from some of our returning vendors. 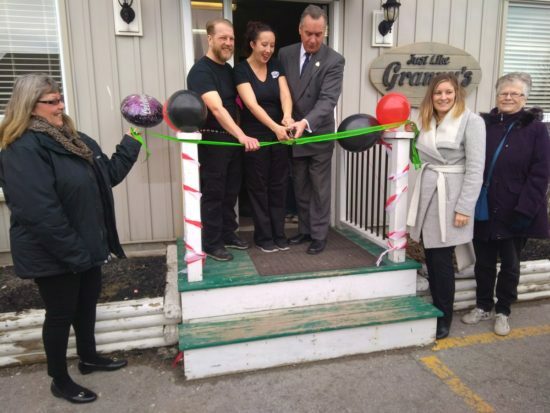 Healey Falls Bison Farms has good news to share. 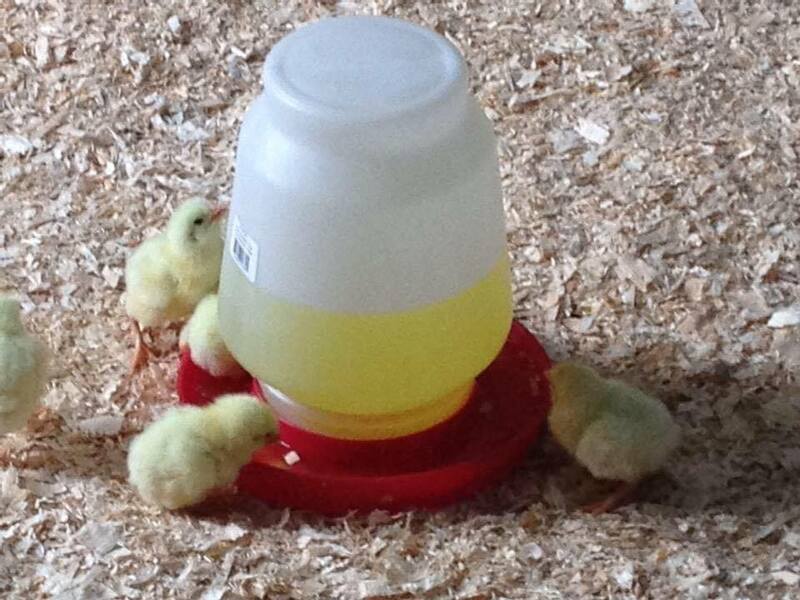 They have been accepted into the Chicken Farmers of Ontario’s “Artisan Chicken Program” which means they’ll be able to sell chicken at the market this year! Wendelin tells us that she and Allan are planning to raise almost 700 chickens. The first batch of birds will be ready for sale by the end of May or early June. They plan to offer whole chickens, chicken parts, and ground chicken. With bison, dog treats, and hot coffee for sale too, Healey Falls Bison Farms continues to be a vendor you can’t afford to miss! The Melly Rolls kitchen is always a beehive of activity! Melissa has kept busy this winter with catering, pop-up markets, and recipe development. Butter tarts are now on Melissa’s menu (yippee! ), she’s experimenting with Aussie meat pies, and her new candied ginger snacks are delicious! Wayne Howson of Howson’s Pure Maple Syrup and Honey reports that the maple syrup has started to run, but cold temperatures have meant that the season is starting slowly. No matter, Howson’s Maple Syrup is well worth the wait!! 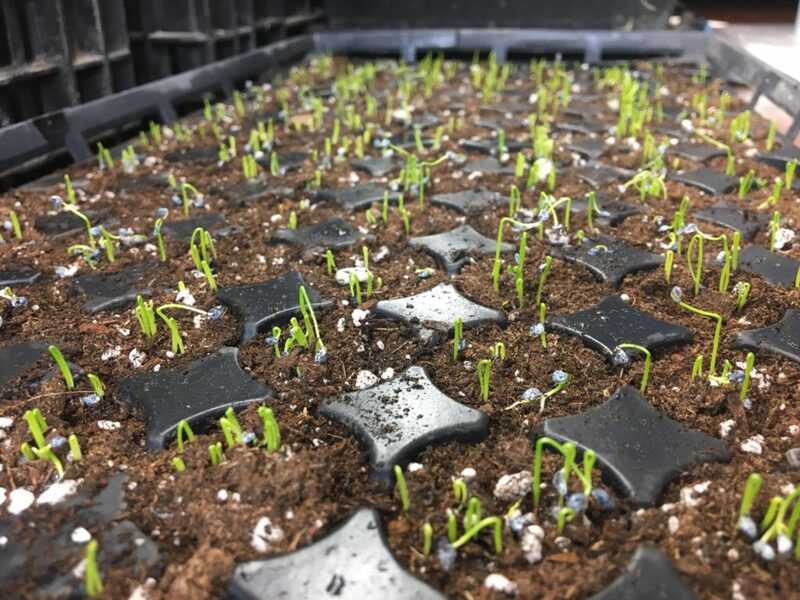 And at Undercover Farm the 2019 growing season has begun! 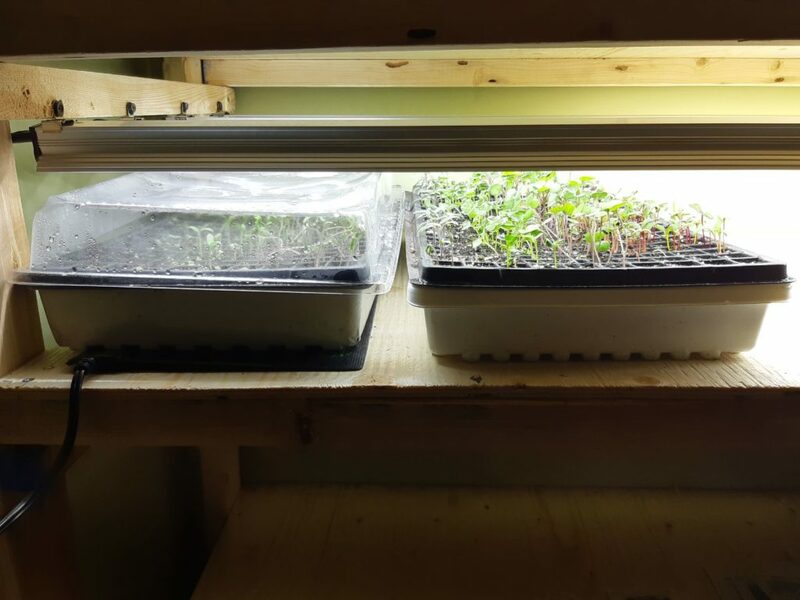 Nadia grows her seedlings indoors, usually until April, when her unheated greenhouse is warm enough to protect them. I can’t wait to bite into one of her juicy tomatoes! At Vokes Farms, Andrew has built some new shelves for under his grow lights. He’s got peppers, tomatoes, eggplant, kale, swiss chard, ground cherries, and tomatillos on the go. He’ll be starting some of his yummy ferments for market next week. And finally, lots of excitement at Braelea Acres! The Herfsts have been busy lambing. They have close to 40 lambs at the farm these days. 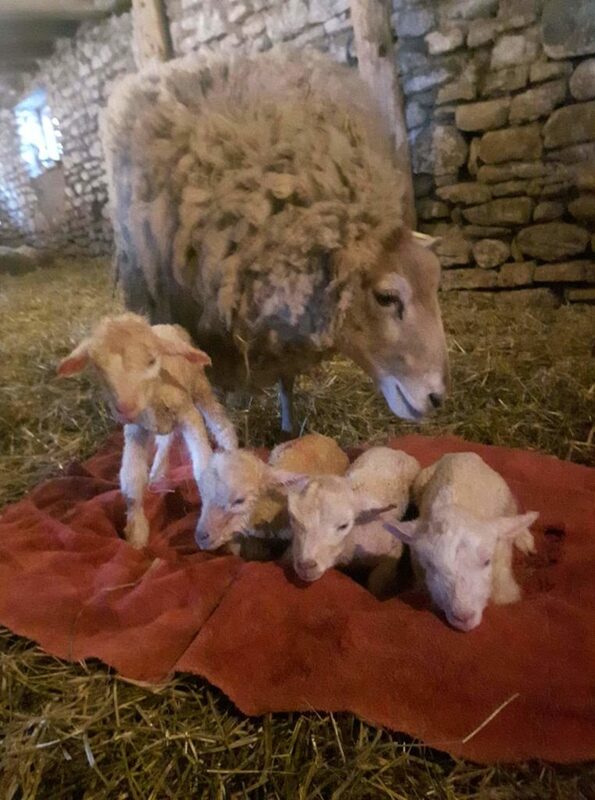 A ewe named Buddy, gave birth to quadruplets on Monday – four healthy boys! Thanks for reading and don’t forget to mark May 1st and May 4th on your calendars! Just when you think the season should be winding down, we’ve got new products and vendors to share. But first of all – a big thank you to everyone who supported us last weekend at our rainy Thanksgiving Saturday market. We had a good day of sales despite the weather. We hope our food contributed to delicious feasting! If you were one of the brave ones that came out in the rain, you’ll have noticed Wendelin and Allan of Healey Falls Bison Farms tucked up warm and dry in their new trailer. The weekend before last, their market tent got destroyed in the wind and they decided to buy the trailer (the “Cuppa” trailer) as a replacement. 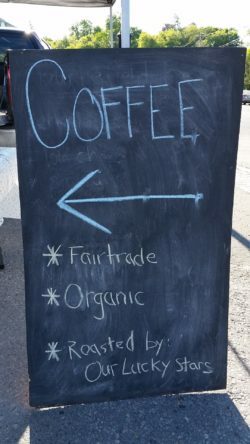 Good news is that they’ve decided to start selling coffee too! Such a welcome addition to the market for cooler October Saturday mornings. If you’re not a coffee drinker but are looking for something to warm you up, Melissa of Melly Rolls is starting to sell soup by the cup! Every Saturday until we’re done at the end of October, Melissa will have soup for sale. This week it’ll be Red Curry and Coconut Vegetable Soup. I can’t wait to try it! If that’s a not a reason to hop out of bed on Saturday morning I don’t what is! Melissa is also adding Apple Hand Pies to her menu. Be sure to come early before she sells out! We’ve got a new artisan vendor joining us this Saturday. 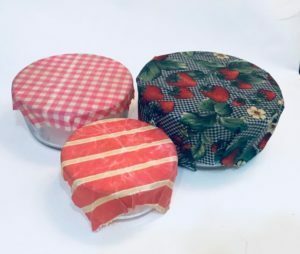 Haley McTaggart of The Busy Bee Goods will be bringing her innovative beeswax food wraps and snack pouches. 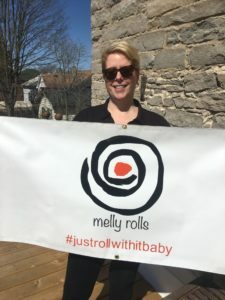 If you’re looking for ways to cut out single use plastic (like plastic wrap or sandwich bags) you might want to talk to Haley and give her food wraps a try. She makes them from 100% cotton fabric and beeswax from her grandparents’ bees. The wraps are reusable, versatile, and easy to wipe clean. We’ve still got lots of produce at the market. Cecil’s table has been full of onions and potatoes. Glenlea Farm has got a new batch of Mixed Sprouts in the works and lots more parsnips to dig up. Braelea Acres will have peppers, eggplant, celery, tomatoes, carrots, squash, pumpkins, and a few quarts of beans. The apple orchard at Russett Farms has been fantastically productive considering we’ve had no rain this summer. Sandra will have MacIntosh, Cortland, Gala, and the last of the Northern Spy apples this week. 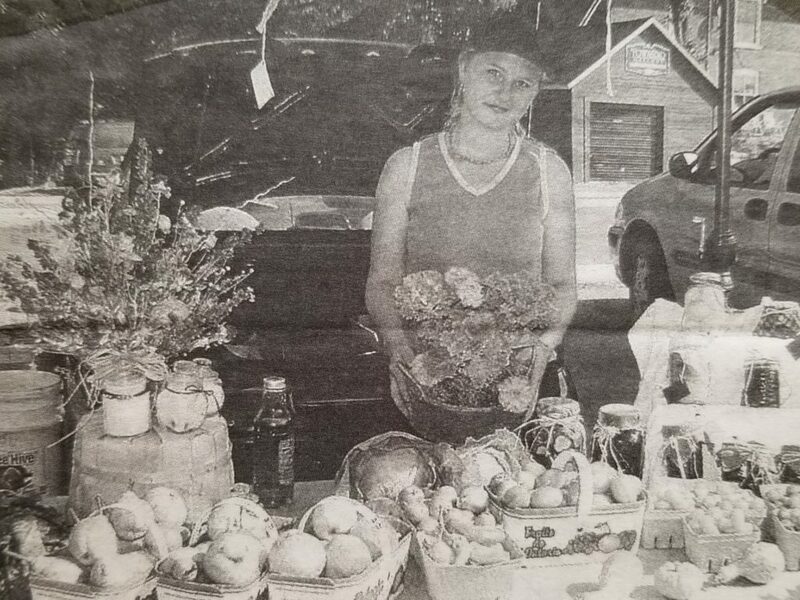 Be sure to market your calendars for our Campbellford Farmers’ Market Christmas Sale on Saturday November 17th from 9am – 2pm. We’re holding it at the Masonic Lodge in Campbellford again this year – across the street from our regular market location. We’ll have produce, baking, greenery, wreaths, local meat, and great gift ideas from our juried group of local artisans who you’ve seen at market throughout the summer. Musician – Jessamyn Pedersen performs for us. Artisans – Sign Design, Studio Grace, and the above mentioned new vendor The Busy Bee Goods. Thanks for reading! See you on Wednesday and Saturday until the end of October! Labour Day weekend signals the end of summer vacation for a lot of people. If you’ve got kids heading back to school on Tuesday, then school lunches are likely on your mind as you buy groceries this week. We’ve got lots of tasty, easy to pack options at the market, to start the school year off right, and keep those lunch bag blues at bay! Have you had a chance to try the beef jerkey from Russett Farms? It’d be perfect for packed lunches. The taste and texture don’t even compare to store bought jerky. It’s so good! Healey Falls Bison Farms also makes jerky out of their fabulous bison meat. They’ll have it in two flavours this week; regular and hickory. Healey Falls Bison Farms will have some homemade pepperoni sticks too. Kids just love them! For another easy protein option, be sure to swing by Rainbow Terrace for some Hummus. Amanda uses their home grown garlic in her Hummus and it’s delicious spread on crackers or used as a dip for vegetables. New this year, Rainbow Terrace also has a Gourmet Garlic Dip and Dressing that’s spectacular with raw vegetables. My boys polished off a plate of celery in the blink of an eye the first time I brought the Gourmet Garlic Dip home! Our produce vendors will have lots of lunch bag friendly veggies this week; cherry tomatoes of all colours, sweet rainbow carrots, cucumbers, cantaloupe, the list goes on! 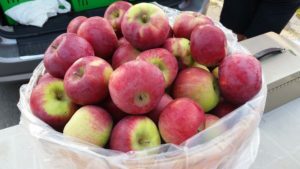 And we’re really excited about the news from Russett Farms that the first of this year’s apples are going to be in this week! How about an apple for the lunch bag and another for the teacher’s desk? For the sandwich crowd, Wholesome Breads by Erin is a good place to start for healthy organic bread. Each week Erin has several bread varieties to choose from. To put in your sandwich, Glenlea Farm will have mixed sprouts this week. They’re a nice non-soggy alternative to lettuce. And to top it all off are sweet treats of course! 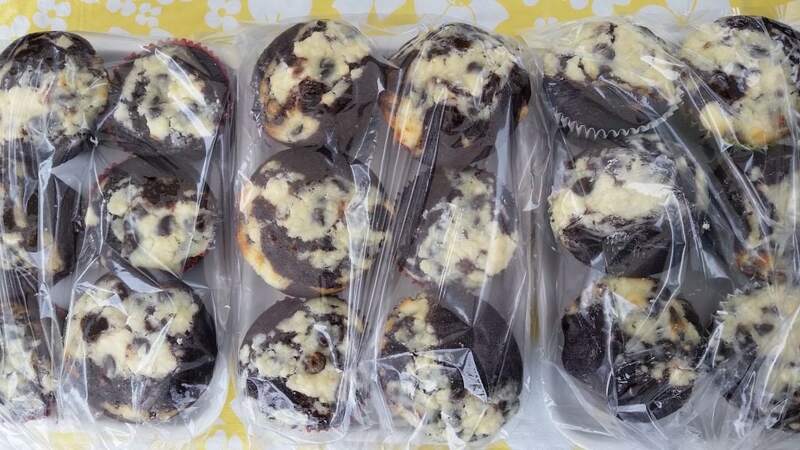 Make sure to stop at A2 Baking Creations for buttertarts, jam jam cookies, and my favourite – chocolate cream cheese muffins. Delicious! The Philosopher’s Scone always has something different to try. Val is a pro at coming up with such interesting scone combinations! But if you’re less adventurous and more of a classic chocolate chip cookie lover – never fear, you’ve got a few to choose from at the market this week. A2 Baking Creations and Melly Rolls will have lunchbox friendly chocolate chip cookies that’ll keep smiles on the faces of even the pickiest eaters! But please don’t let all this talk of back to school and packed lunches get you down. Vacations may be coming to an end, but we’ve still got lots of summer left in September! Thanks for reading, and we’ll see you at the market! Sometimes it’s all best said with photos. Here are a few from Saturday market this past week. It’s so exciting to be surrounded by this bounty! Join us this Wednesday and Saturday for more locally grown produce. You never know what you’ll find! And of course we’ll also have meat, honey and maple syrup, baked goods, flowers, and more! We’re joined by artisans Studio Grace, Susan Gibb, and Relatively Rustic. And the talented Ivan Stille will be performing for us! Thanks for reading. See you this week!